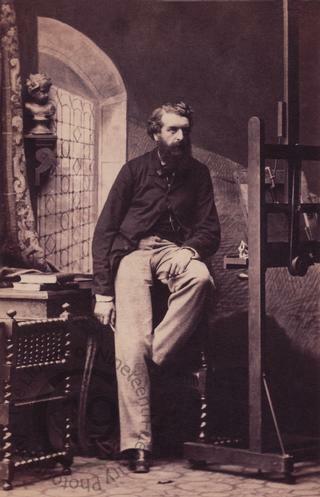 A carte-de-visite portrait of the British artist Henry Wyndham Phillips (1820-1868). The younger son of the portrait painter Thomas Phillips, Henry Wyndham Phillips was taught almost exclusively by his father, who at his death in 1845, left him all his painting materials, with the instructions that he should be permitted to use his father's painting rooms at 8, George Street, Hanover Square, until he reached the age of twenty-five. According to the Dictionary of National Biography, he lived at Hanover Square for the rest of his life. He exhibited a few scriptural subjects in the 1840's but worked mainly as a portraitist. He was solidly employed throughout his painting life and among his commissions were the portraits of Charles Kean as Louis XI for the Garrick Club, Dr William Prout for the Royal College of Physicians, and Robert Stephenson for the Institute of Civil Engineers, all in London. Between 1838 and 1868, he exhibited 76 pictures at the Royal Academy and 13 at the British Institute. He also served for thirteen years as an energetic Secretary of the Artists’ General Benevolent Institution. Photographed by Camille Silvy of London on 13 June 1862.